On Friday, October 10, 2014, Humanitarian Support Foundation Virginia employees volunteered at the Grace Network Pumpkin Patch held at First Baptist Church in Martinsville, Virginia. Although inclement weather was a threat, there were many families that visited to try and locate that “perfect pumpkin”. There were several different varieties of pumpkins and gourds to choose from. Grace Network provides services for the community, including but not limited to, financial assistance for housing, heating and cooling assistance and tax preparation assistance. Proceeds from the Pumpkin Patch go to assist with these services. Humanitarian Support Foundation recently participated in a successful fundraiser for the Pregnancy Care Center of Martinsville and Henry Co. 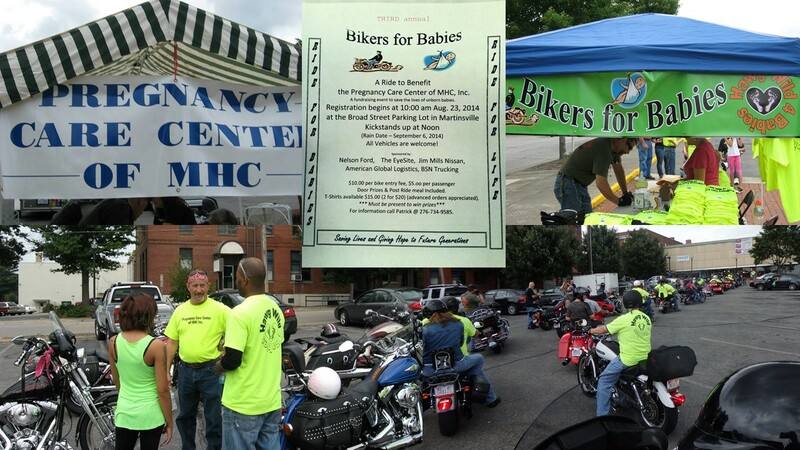 The host, “Bikers for Babies”, included 45 motorcycles and two hot rods. The group traveled from Uptown Martinsville and ended at the Pregnancy Care Center. Outside of the tour, the event offered $800 in door prizes, T-shirts, embroidered patches, concessions, and an after ride meal of pizza. In total, the group successfully raised $3463 in the form of cash and services for the Pregnancy Care Center of MHC. The Pregnancy Care Center of MHC is a non-profit organization that aids young mothers by providing educational classes and support, as well as, medical attention to ensure healthy child development. Diapers, formula and other necessities are also provided after the child’s birth.